Care @ Home provide efficient and effective care to meet the needs and aspirations of the service users in a caring manner. 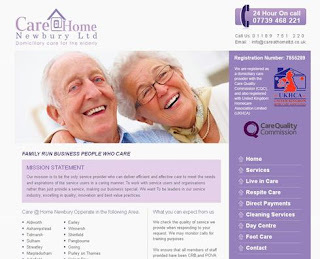 The client wanted to redesign their existing website they had with us to apply a modern design. Along side this we also refreshed their logo to introduce a new colour scheme. Included within the redesign was the migration from our old platform to our new webkit platform. The webkit upgrade has been written with the latest programming languages. This upgrade works in parallel with your website to improve loading times across all internet browsers plus much more. As the new design is on our webkit platform we were able to introduce bespoke forms. This client wanted to have an enquires form on their contact page to capture all the information they need. When the client was asked to rate the service that we provided, he said that "Thats great all good"